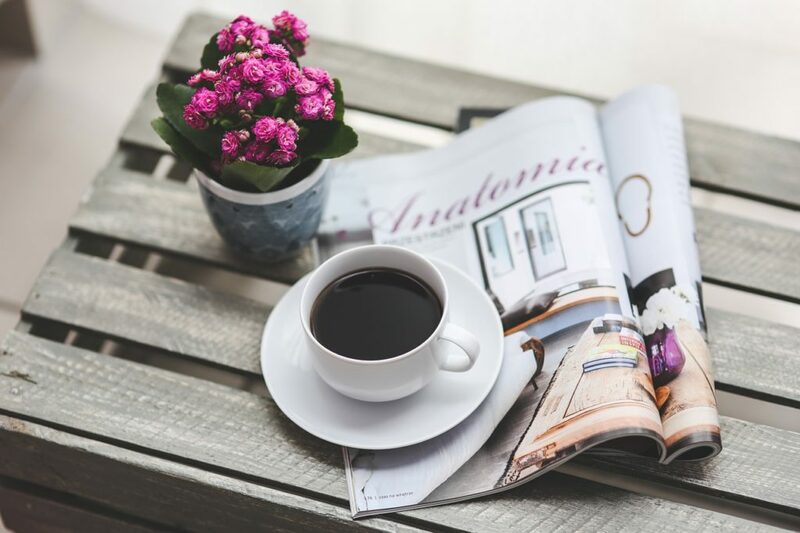 For coffee enthusiasts who want to brew a better cup of java at home with our organic coffee beans, here are six popular manual coffee brewing methods to consider using, beyond the household automatic coffee maker. Your preferred method will boil down to your personal taste, time and technique! There is a wide acceptance that manual brewing methods allow for better quality control and a superior coffee experience. For many, it’s more fun and fascinating to have a hands-on approach with their brewing process rather than hitting a ‘brew’ button on a machine. The growing trend or movement for gourmet-type coffee making has resulted in a staggering range of gadgets and differing opinions. While we support all styles of coffee brewing, our focus this time will be to touch on six of the more crowd-pleasing manual coffee making options that could complement our single origin, organic coffee beans, available at any of our coffeehouse locations. 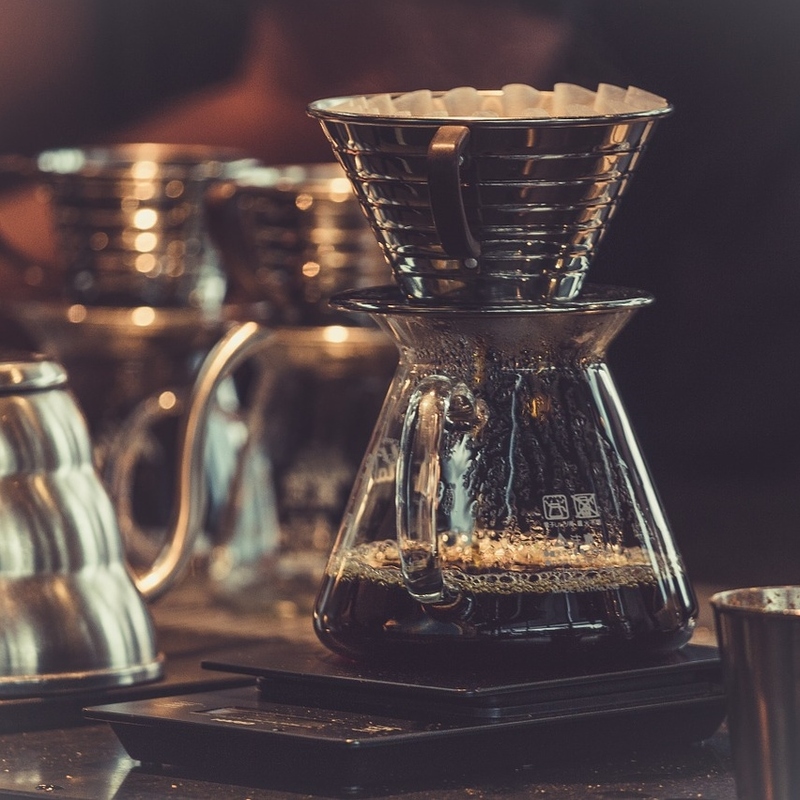 Below is a brief overview of six manual coffee making styles, including some quick tips, as a starting point to help you select your preferred method of infusion, from pour over/drip, plunger/pressed, percolate to vacuum. 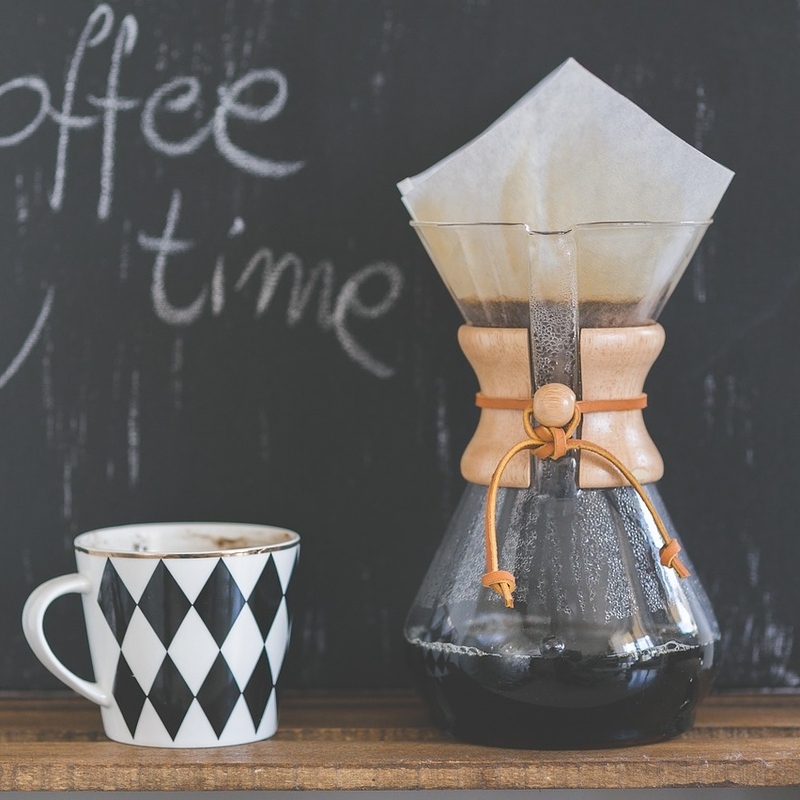 One of the oldest, simplest, fastest and cheapest ways to brew coffee is the drip method using a coffee cone and paper filter. Hot water is poured evenly over coffee grounds in a paper filter. With gravity, the brewed coffee drips slowly and directly into a cup or pot. Coffee cones are made of plastic, glass, stainless steel or ceramic. The shape of the cone and their filters will influence the flavours. 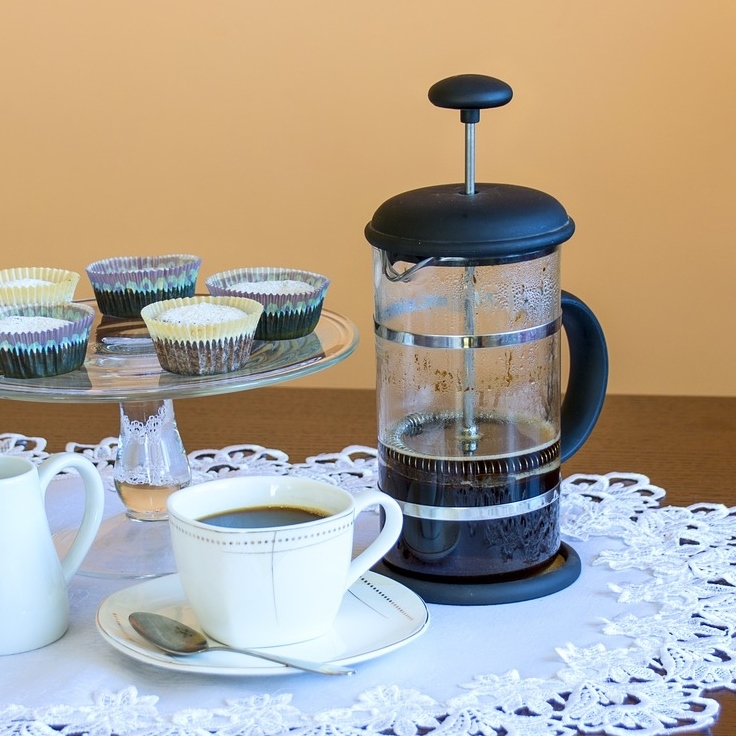 Popular brands include Melitta, Hario V60, Kalita Wave and Bee House. 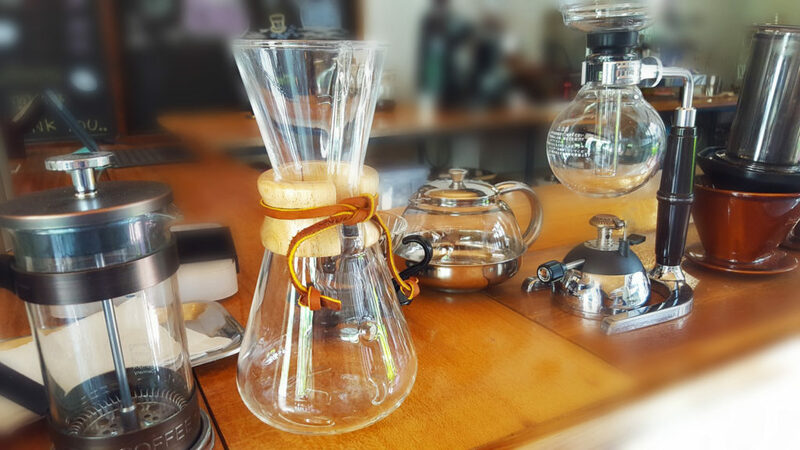 Chemex is a beautifully designed and elegant pour over, glass flask that was invented in 1941 by Dr. Peter Schlumbohm. It uses a special Chemex paper filter that is 20-30% heavier than other filters. Similar to the coffee cone, hot water is poured over coffee grounds in a paper filter. 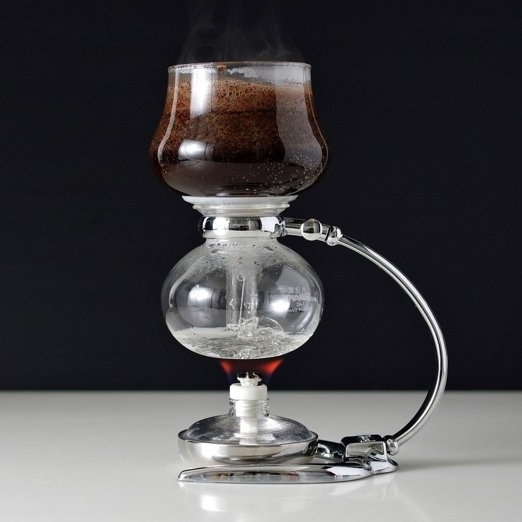 The brewed coffee drips into the bottom of the flask which doubles as its own carafe. The French Press method, invented in 1929, is widely considered as the best and easiest method for brewing superior and consistent coffee. It extracts, arguably, more superior flavours than any other method. In a press pot, ground coffee is soaked, steeped and strained in hot water; therefore, coffee’s flavourful essential oils, caffeine and antioxidants are better diffused and preserved leaving the purest flavours of the coffee. It is well suited for coffee drinkers that enjoy a luscious, expressive and complex taste experience. Refer to our 5 Tips and Steps For Brewing Better Coffee at Home for more details about this method. The most common brand is Bodum. Relatively new, the maker of Aerobie Frisbee (Alan Adler) created and launched the AeroPress in 2005. The AeroPress is plastic and comes in 3 parts. A filter sits in a coffee basket at the bottom of the brew chamber. Coffee grounds rest in the brew chamber where hot water is added then immerses/steeps the coffee. 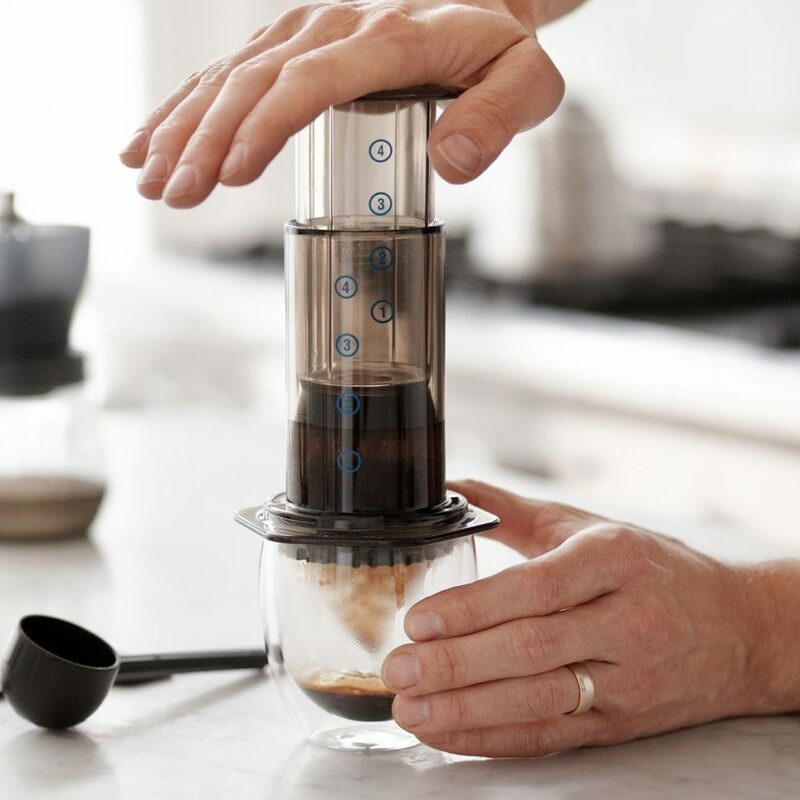 To extract the coffee, a plunger is pressed down creating air pressure to force brewed coffee through a filter and into a cup. 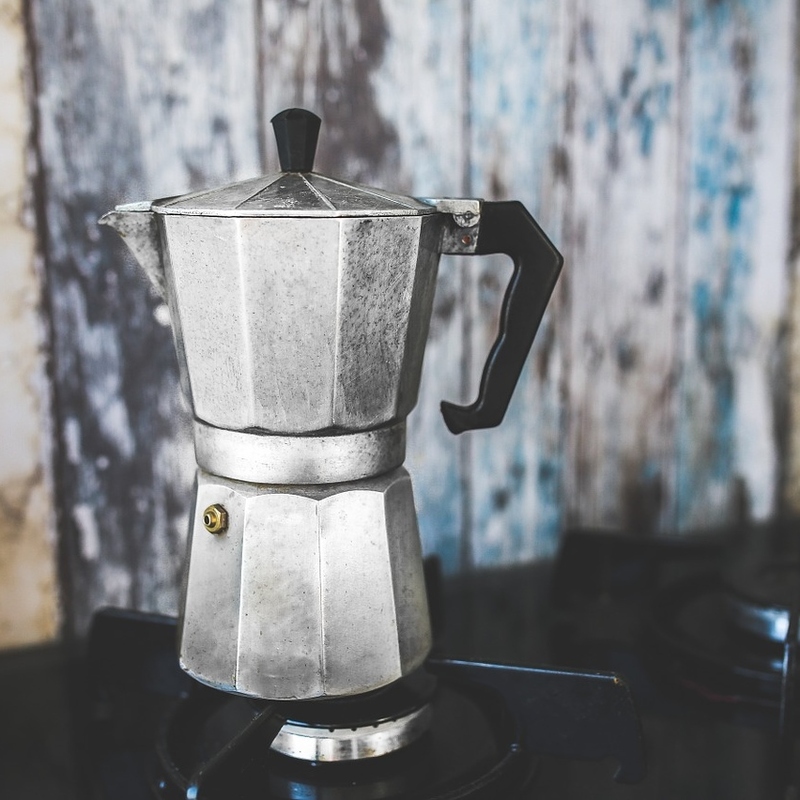 Originally patented in 1933 by Alfonso Bialetti, stovetop style coffee makers use steam pressure from boiled water in the lower section to pass through coffee grounds in the mid chamber of the pot. Brewed coffee then sits in the higher chamber. A well designed stovetop pot will created better pressure. Common brands include Bialetti, Pedrini, and Kabalo. The siphon is a fancy and flashy coffee maker. It can be a fun way to make coffee and impress friends at the same time, but it can be a fussy process. It was invented in Germany in the 1840s. Coffee grounds are added to the upper vessel and vapor pressure forces hot water up to immerse the coffee. Once the heat is removed, gravity pushes the brewed coffee back through a filter into the bottom vessel. Common brands include Hario, Yama and Bodum. Delicate and hard to store. Not portable. Before use, rinse filters with hot water to remove any chemicals on the paper. Most common sized filters are also available unbleached. For the pour over methods, employ a slow and steady pour of hot water in a spiral motion from the center outwards to thoroughly saturate all the coffee grounds evenly, which ensures optimal extraction. To achieve even water distribution for the pour over and pressed coffee making methods, use a narrow spouted pouring kettle. Start with cold, filtered water when possible. Hot water should be just off boil (205F or 96C). Rinse the makers and cups with hot water in advance to keep coffee hot for longer. Some trial and error is to be expected when experimenting with new brew methods. Everyone’s taste preference varies, so don’t be afraid to adjust the grind or amount of coffee to suit your palette. Don’t forget to compost your used coffee grinds, filters included! Click here for more tips for storing and grinding coffee beans.